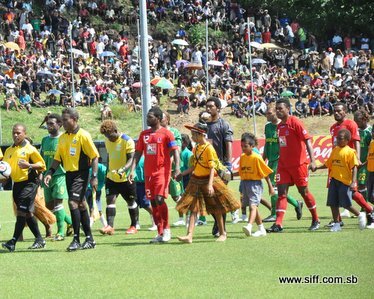 The Solomon Islands Football Federation (SIFF) O-League organising committee is finalising preparations to host the match which is scheduled for Saturday 31st of March. The committee held their second meeting this morning and they are confident that preparations for the match are on the right track. “The second meeting held today has enabled us to confirm several important items ahead of the match on Saturday. We anticipate a great day of football for local fans and the 2 competing clubs and our committee is doing its best to get all logistics in place,” SIFF events manager, Ian Rarawa says. Both clubs will be playing for pride when they meet as the outcome of the match will have no bearing on their qualification status for the O-League finals since they are already out of contention. Koloale languish in bottom place while Hekari United occupy a more praise worthy second place but they are far behind New Zealand side Auckland City who breezed through the season with 4 wins and 1 draw from 5 matches and are favourites for yet another victory when they take on Amicale in Port Vila on the same date as Koloale/Hekari United clash. Koloale only picked up their first win of the season after edging Amicale 1-0 at Lawson Tama earlier this month but it came on the back of 4 losses. Confidence in the club is also shaky especially after a lacklustre performance in the national league on Sunday saw the national champions escape with a draw against Malaita Kingz after the provincial side squandered their chance to win the game with a goalmouth blunder late in the match. However, Koloale captain, Gideon Omokirio is confident that Koloale can lift itself off the bottom of the Group B table and need only to keep their focus up on Saturday. “I think the result on Sunday does not matter, the O-League is a whole different package and I think the team has the ability to pull off a win. Hekari United are a top side but we just need to get our rhythm right to get the job done. It is our objective and we will do our best to get it,” Omokirio said. Hekari United came through a significantly better season than their counterparts Koloale but also share the disappointment of a weak season for the island sides in the group compared to Auckland City. Despite their claim to second place in the group ladder Hekari United could only manage 2 wins and 2 draws from 5 games this season and they will certainly be looking to book their third win when they take on Koloale. The match will kick off at 3:00pm on Saturday. Entrance fees are $60 for grandstand light-blue seats, $40 for grandstand dark blue seats, $30 for the complimentary hill and hillside seating will go at $10 for adults and $5 for children. Tickets will start selling at the SIFF headquarters on Thursday.